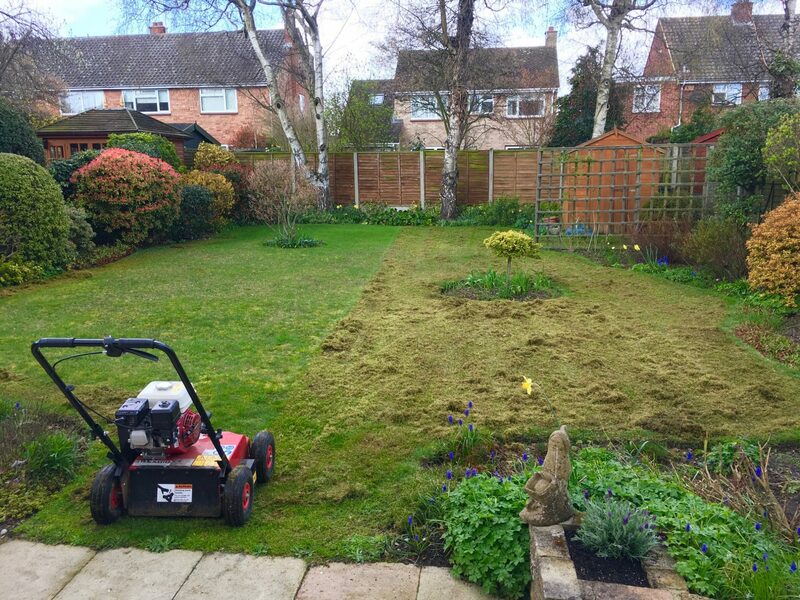 Lawn Scarification is a process perhaps best described as a mechanical raking of the lawn; its primary purpose is to remove thatch from the lawn, although it has associated benefits as well.  The machine used by your Greengrass lawn operative has a series of sharp tungsten blades that rotate at high speed and cut into the turf in a vertical manner. The depth can be adjusted to remove as much or as little thatch as required. This machine and process should not be confused with the typical machine available on the domestic market, which is more of a lawn rake. You will get a much more effective treatment with our intensive machine than you would using a DIY machine. Our lawn scarification process will thin out and remove the excess thatch and moss invasion that has built up within a lawn. Thatch is a naturally occurring layer within your lawn comprising of dead and live grass, leaves, root stems and moss, which is present between the base of the grass stems and the soil bed below. A small amount of thatch in a lawn is considered healthy as it aids its resilience. However, it is easy for this layer to become too thick and affect the health of the lawn. Without removing this dead matter your lawn will quickly deteriorate, making it especially vulnerable to moss, disease, weeds and stress. 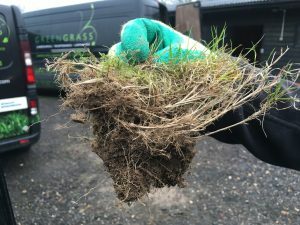 Your lawn treatment operative will take a core sample from your lawn and will be able to show you the layer of thatch present within the lawn. If it is deemed to be too thick they will discuss a course of action with you. When should scarification be undertaken? There are two occasions throughout the year when scarification can be undertaken, ideally spring and autumn. Light scarifying is best in late Spring when the weather starts to warm up, making it easier for your lawn to grow and recover before the heat and dryness of summer. Scarifying your lawn opens it up, allowing air, water, seeds, and essential nutrients to be absorbed through the soil, this process allows for the grass to grow back, leaving you with a much healthier lawn come summer. If your lawn needs deeper scarifying due to heavy thatch or moss infestations, then it’s best for us to do this in the autumn period. This is because heavy scarifying will thin out the lawn and leave the soil exposed in places, making it an ideal seed bed not just for over seeding with your new grass seed, but also for weed seeds to germinate. What happens with the debris? 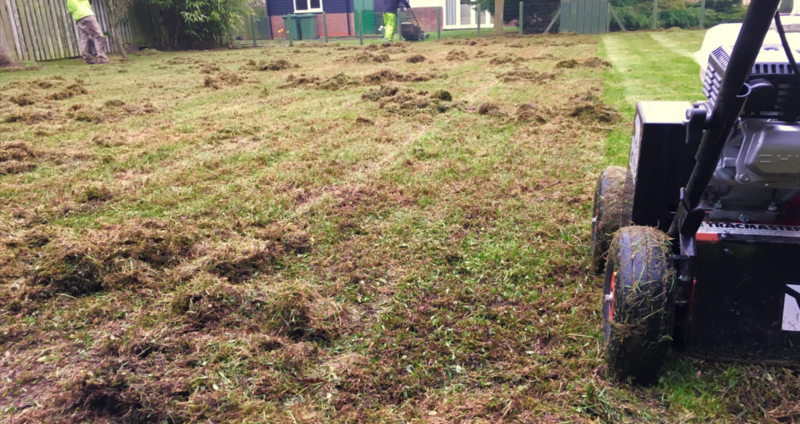 The process of scarifying leaves a large amount of thatch on the surface of the lawn, we can collect the unwanted thatch with a good old-fashioned rake or depending on the size of your lawn via a mechanical machine. We will bag up the debris and can either leave with you to dispose of or alternatively charge for disposal.